“I really like this book.” -said by “K” in my grade 3 class this morning. There are a few Remembrance Day type books on the market aimed at Elementary aged school children - strong, well written and illustrated books that lend themselves to further research and writing projects. Books like this and this are excellent examples of this and I recommend them highly. On the other hand, sometimes you are just looking for a book you can read to kids that will help explain what this whole Remembrance Day / Veteran’s Day thing is all about without having a lot of extra information. Sometimes you just want the story to speak for itself. Well, here it is: Proud as a Peacock, Brave as a Lion. This book is what many of us elementary teachers end up scrounging around for at the beginning of November: a well written and illustrated book that you can read to any of the age and sensitivity ranges that you find in elementary schools. The writer, Jane Barclay has done a great job of bringing out the feelings of war in a safe, but touching and real way. She focuses on the feelings and experiences of one WWII veteran but through this one man, the feelings and experiences of Veterans from many wars, past and present, can be felt. She uses similes brilliantly to help explain a difficult subject. Also, artist Renné Benoit brings out the imagination and memories of the book’s two principal characters in subtle and touching ways. The art completely fits the tone and feel of the story – very nice work. As questions come from a young grandchild, his grandpa talks about how, as a very young man, he was as proud as a peacock in uniform, busy as a beaver on his Atlantic crossing, and brave as a lion charging into battle. Soon, the old man’s room is filled with an imaginary menagerie as the child thinks about different aspects of wartime. But as he pins medals on his grandpa’s blazer and receives his own red poppy in return, the mood becomes more somber. 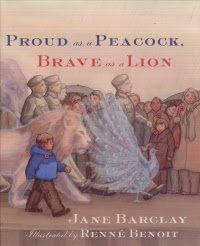 While reading Proud as a Peacock, Brave as a Lion my own wife was brought to tears remembering what her own paternal grandfather shared with her and thinking of what her maternal grandfather would not. When she first read it, she came to me and couldn’t stop talking about it. I actually work with the writer’s sister (a fact I discovered when talking about a book I had to read to my daughter every night, which turned out to be one of her other books) and she gets teary every time she reads it. If you are a teacher who has to deal with Remembrance Day / Veteran’s Day at all, then this is really a book you want to pick up and put on the shelf for next year. I think it would help Middle and High School students really understand why a teen would rush off to war. If you are a parent, this is a book that may help when your child comes asking difficult questions about the images seen on the news. I read a lot of new children’s books every year, and this is one I want to see news reports about and, and on special displays in bookstores and being pushed by Scholastic. Be sure to visit us at comicsintheclassroom.net for all-ages comic reviews, news and interviews.